Hot chicks, fast ships, and whiskey … some things never change … and at nearly cask-strength, this blended Scotch has flavor to spare. Cutty Sark has been around a long time … since 1923. But they are a whiskey produced by The Edrington Group, which as been around in various forms since 1850 and is owned by the Robertson family. Why do you care? Because they make a LOT of whisky, including perennial single-malt favorite The Macallan, The Famous Grouse, and Highland Park for goodness sake! They also own Brugal, which is the leading golden Rum in the Caribbean and Snow Leopard Vodka. The Edrington Group are not one of the super-giant-behemoths, but there is some serious skill in their bottles. Cutty Sark produces a wide range of blended Whiskies that have formed the core of back-bars for decades. The Whisky gets its name from the ship—The Cutty Sark—which was one of the last and fastest sailing cargo ships ever made. And it was built just a few miles from the distillery about the time the Robertson's started distilling near Glasgow, Scotland. The ship, in turn, was named after … ahem… a scantily-clad character in Robert Burn’s famous poem, “Tam ‘o Shanter.” In fact, “cutty-sark” roughly translates to “short skirt” in the local vernacular. Hot chicks, fast ships, and whisky… some things never change. A carving of the fetching and bewitching lass was carved into the bow of the ship. Cutty Sark Prohibition is dedicated to the “notorious Captain William McCoy” who smuggled Cutty Sark into America during the dark days of Prohibition. So for this special edition bottling of their core blended Scotch Whisky, they pulled out all the stops. The bottle is rich black glass, the label old-school, and the spirit is bottled at 50% ABV like it was back in the 1920s. The normal Cutty Sark is 40% ABV, so Cutty Sark Prohibition makes that other stuff look like a schoolboy. And all Cutty Sarks are “blended Scotch” Whiskies, which means that they balance it out with other grains to ensure a consistent flavor profile. At nearly cask-strength, it has flavor to spare. In the film Goodfellas, Joe Pesci’s character—Tommy De Vito—orders a “Cutty and water.” It was one of the most popular drinks among mobsters during their heyday. 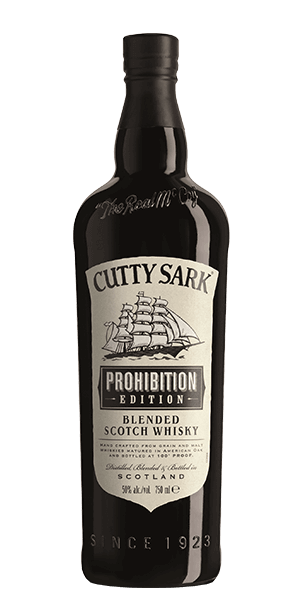 What does Cutty Sark Prohibition taste like? The Flavour Spiral™ shows the most common flavours that you'll taste in Cutty Sark Prohibition and gives you a chance to have a taste of it before actually tasting it. Delicious and remarkably smooth for it's ABV. I was not expecting this to be as great as it is. Highly recommended. I liked it, it would have been better if it were aged more. It was quite sweet and smooth. It is good with a splash of water or on the rocks. Let's you know it has a bite. On the nose i get honey, caramel and some malt aroma. The palate is mollasses, plums and pepper. Really approachable for 50% APV. This is great for the price. Definitely a weirder one.. A good candidate for some added water. Very spicy. Scotch has has a harsh burn, with a funky after taste. Very potent body, that is very off-putting. Very strong with a hard bite. Needed to water this one down a little and even then, just not to my taste. Excellent taste. but the finish was a little rough. Peppery with hints of vanilla, could have more refined flavors and a smoother finish.